Natural stone kitchen counters make stunning additions to any home. Stone has a unique beauty that cannot be reproduced by other materials, which is why it remains such a popular surface after so many years. Many stones may be used on the counter, but two of the most common are granite and marble. Both stones are available in slabs that can be installed as counters, and they provide years of use. But, these two materials are very different from one another in the way they look and function in a busy kitchen environment. We outline their differences below so that you can make a more informed decision for your home. Both granite and marble are natural stones. In the case of slabs sold for countertops, there are many different minerals and stones sold as either granite or marble because they contain similar composition and characteristics. Commercial granite is an igneous or metamorphic stone that is mainly comprised of silica, feldspar, mica, and quartz. Stones labeled as granite usually have a tightly packed, granular appearance to their surface. They may have veins, flecks of color, or be solid. Granite comes in a wide range of colors from very light to very dark, and each slab has some degree of variation in color over its surface. Commercial marble is either metamorphic or sedimentary in composition, made primarily of calcite. Some “marbles” may be a type of quartzite or quartz-based stone, and green “marbles” are made of a mineral called serpentine. Marble is usually characterized by having veins and a smoother surface texture than granite. Like granite, marble ranges from white to black in color and will have some degree of variation in color over its surface. Both marble and granite vary in appearance from slab to slab because the minerals that make up the color of the stone may change depending on where it is cut from. For this reason, it is always recommended that you visit a stone yard and select the stone you want in person. Showroom samples of either marble or granite will not provide a true representation of what the stone will look like. Marble and granite counters are fabricated and installed in the same way. A template is made of your counter, and this template is transferred to the slab you want for your kitchen. 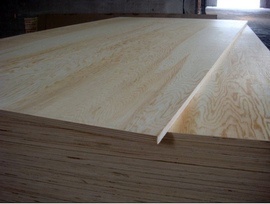 The slab is cut to match the template and given a finished edge and any cutouts. The slab is transported to your home, and a silicone adhesive is applied to the perimeter of the cabinets. The slab is then lowered into place. Some thinner marble slabs may need to have a plywood 1 substrate installed on the cabinets first to strengthen them, but any 1¼-inch (3-cm) slab can be installed directly on the cabinets. Because marble slabs are usually smaller than granite slabs, you may need more pieces to complete a full kitchen if using marble. 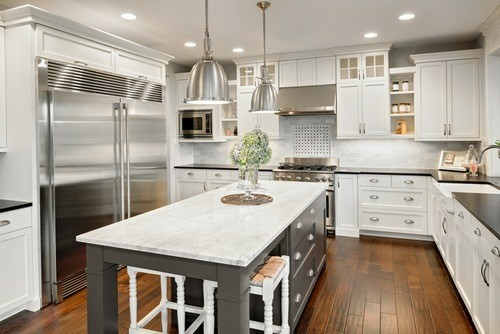 Granite counters range in cost from $40 to $75 a square foot on average. More exotic stones, such as stones colored blue, may range in cost as high as $500 a square foot. For a 30-square-foot counter, the average material cost is around $1,000 to $1,500. Fabrication and labor add around $330 to the cost of the stone, a sink cutout adds another $100, and edging adds about $10 a linear foot on average. This makes the 30-square-foot granite counter cost between $3,000 and $3,500 installed. Fabrication, installation, cutout, and edging costs for marble are around the same cost. Material costs for marble are higher, starting at around $60 a square foot and going as high as $100. This makes the material costs for a marble counter of the same size between $1,800 and $3,000 making the total range $3,800 to $5,000 on average. The durability of the stone you choose is dictated by its makeup. Most marbles are made of calcite, which is a very soft and porous mineral. This means that marble will be more likely to absorb stains and to etch or lose its finish over time. Having a honed, or matte finish, for your marble counter can help disguise some of the etching. However, not all marble is made primarily of calcite. Green marble, made of serpentine, does not etch as easily, but it can spall or flake with prolonged contact with water. Quartzites that are labeled as marble, like Thassos or Azul Celeste, are extremely durable and much harder than some granites. Granite can range dramatically in terms of durability. True, igneous granites and gabbros, such as Absolute Black, are nonporous, do not require sealing, nor easily scratch or etch. Most dark-colored granites are also impervious to staining and etching. Some light-colored granites, however, are actually dolomites, which is a metamorphic stone. These may scratch, etch, or stain. In general granite counters are considered more durable than marble. However, each stone is given a rating from A to D. Any stone rated D is considered weak, while stones rated A are considered strong. Every natural stone has its own level of required maintenance. Even among granites or marbles, there are variations. However, most granites are lower maintenance than most marbles. For granite, all stones except black should be sealed shortly after installation. A well-sealed stone will bead water on its surface. When the water stops beading, the stone must be resealed. In addition, always wipe up spills as soon as they are seen to prevent potential staining, and wash the stone with a PH-neutral cleanser to prevent etching or removal of the finish. For marble, all stones should be sealed regularly with a sealer designed for porous stone. Even with a sealer, marble may stain more easily, which can be difficult to get out even with a poultice. Always wipe up spills as soon as they are seen, and avoid placing acidic things like lemon juice, tomato sauce, or red wine directly on the counter because these can cause the stone to etch. Like granite, marble should always be cleaned with a PH-neutral cleanser to avoid more etching. It should also be resealed at least once a quarter, as opposed to yearly for granite. Both granite and marble are heat-resistant. Both types of stones were formed through heat, either through volcanic activity or enormous amounts of heat and pressure. Typically, hot pots will not bother either stone, and neither will discolor when used near heat. Always use caution with hot pots in the kitchen, regardless of how well your stone handles the heat. Decomposing granite, which is found in soil, has been known to give off radon 2 gas. So naturally, some people are concerned about using granite counters in their home. There is no evidence, however, that either granite or marble slabs give off radon 2 gas in the home. If you are concerned, radon 2 test kits are available, which can detect the gas. On their own, granite and marble counters do not have much impact on resale value. As part of a luxury kitchen upgrade, however, Remodeling Magazine shows that you can recoup roughly 53% of the total costs. 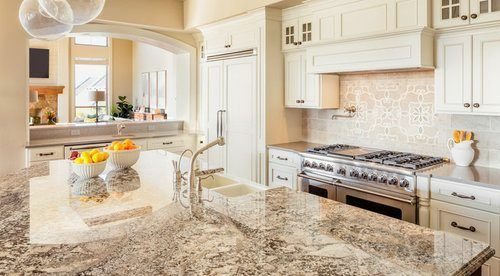 Both granite and marble can make a kitchen look more appealing to a buyer, which may help the property sell more quickly, particularly if the old countertop was in poor condition. A colorless, odorless, cancer-causing, radioactive gas. Cost Considerations: Radon tests are relatively inexpensive. Most cost between $100 and $916 depending on whether you use a home testing kit or hire a professional company to come out and test all of the rooms of your home. You can typically correct most radon issues for $500 or less.